There’s a sense of inevitability to the sheer variety of ways in which the Sounders keep steamrolling opponents early in games. No one has figured out how to stop it yet, explaining why a team that needed 13 games to reach the 10-goal mark a year ago now has that many in merely three contests. And it’s no fluke, with five different players accounting for the goals and three of them having scored multiple times. Jordan Morris and Raul Ruidiaz are tied for the team lead with three goals apiece while Kelvin Leerdam has two. In fact, a dubious offside call in Saturday’s first half was the only thing keeping right back Leerdam from joining the team scoring leaders after his 26th-minute strike was waved off. Sounders general manager Garth Lagerwey and coach Brian Schmetzer have spent much of the past two years drooling about how this team could look if all of their players ever made it on the field healthy at the same time. And this month has been the first time that’s truly happened. The goal-scoring of Nicolas Lodeiro alone practically carried the team to the 2016 MLS Cup title. Now, with Ruidiaz imported for the main scoring duties last summer, the speedy Morris back to his 2016 Rookie of the Year form and the playmaking Victor Rodriguez fully healthy for the first time in two years, Lodeiro has become arguably the best assist man in MLS. He’s got three already this season after compiling a club-record 16 last year. Since joining the Sounders, he’s got 39 — eight more than the next closest MLS player over that time frame. Throw in the lightning-quick Brad Smith on the left flank — coupled with the suddenly goal-dangerous Leerdam on the right — and opponents can’t quite figure it out. It’s one thing to draw up pregame plans on paper, but seeing it firsthand in a live game situation has defenders chaotically whipping their heads around to keep up with whoever has the ball. About the only thing capable of stopping the Sounders thus far has been themselves. And that’s tempered some of the enthusiasm over a 3-0 start to the season in which they’ve outscored opponents 10-3. In all three games, the Sounders have scored multiple first-half goals — often in the first 30 minutes. But then, perhaps from overexertion, or not staying disciplined in their quest for additional scoring, they’ve allowed opponents to stick around in games that should have been long over. Saturday’s victory at Chicago was the latest and most poignant example. If not for the offside call on Leerdam, the Sounders would have been up 3-0 by the 26-minute mark — never mind 5-0 had Chicago goalkeeper David Ousted failed to make a pair of spectacular saves. But then, the Fire forced Frei into some huge saves of his own and could easily have gotten back into it. Chicago then nearly overcame a 3-0 deficit in the second half as well, scoring twice before Ruidiaz added his third of the season. Frei, Lodeiro, Cristian Roldan and others have spoken about needing to do a better job controlling the tempo of a game. And of withstanding pressure from opponents when they do generate some offense the other way. Indeed, there are times when — in pressing forward with their relentless thirst for goals — the Sounders have gotten uncharacteristically careless. The first Chicago goal saw Raheem Edwards left completely unmarked in the box for an easy header, while the second had some Sounders defenders standing around watching as Fabian Herbers picked himself up off the ground and scored on his own rebound. 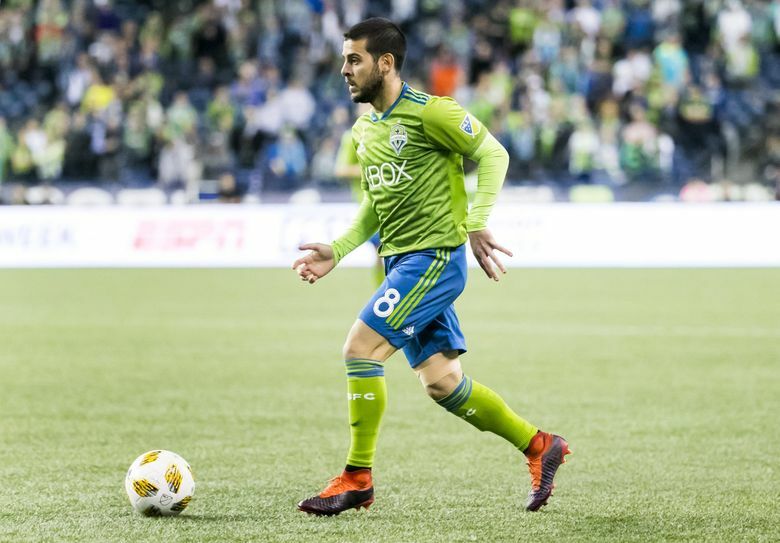 In their previous victory, over Colorado, the Sounders jumped ahead 2-0 early as well, then started turning the ball over in the attacking end throughout the second half. There had been musing afterward about needing to possess the ball longer and slow things down a bit once jumping ahead — something that happened only infrequently Saturday. The final possession statistic of 47 percent for the Sounders was the first time they’ve been below 60 percent this season. Still, nobody is dwelling too much on the negatives. After all, the Sounders are slotting home goals at an MLS-record clip, their average of 3.3 per contest probably about two goals below where it should be after a plethora of misses. They’ve won all three matches by multiple goals thus far, and about the biggest criticism is they aren’t destroying teams as badly as they could be on the scoreboard. Schmetzer, thrilled by the strong start, nonetheless plans to tighten up some defensive areas before the next game during the two-week FIFA break. The coach noted that, after the team’s only other 3-0 start — in 2009 — it was shut out at home by Kansas City and then again at Chivas USA. That Chivas team was coached by former U.S. Men’s National Team member Preki, now a Sounders assistant coach tasked primarily with, of all things, upgrading the team’s attack. That mission accomplished thus far, Preki and Schmetzer will make sure the messaging is there about getting too bigheaded over goal-scoring and forgetting other aspects of the game.